Imparting Grace: Will your anchor hold? Like many of you, my heart is heavy these days. In light of the tragedies of the past several weeks, the American political conventions seem ridiculous, almost scandalous. Certainly we are facing the storms of life in the United States and around the world. And while political leaders and government policies might be important, they will not save us. They do not offer an anchor that will hold. Only the Savior offers that. So true, Richella! Love that old hymn! 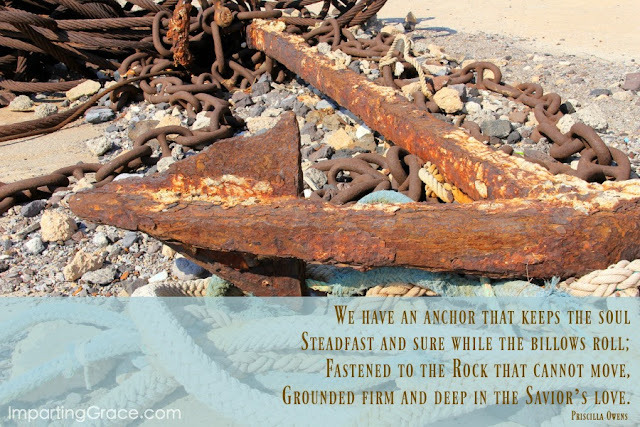 I've had a thing for anchors the past few years... one of my favorite verses is the first part of Hebrews 6:19- We have this hope as an anchor for the soul, firm and secure... ♥ You're right-- this world is feeling more ridiculous as of late, but our victory is sure. Have a blessed day Richella!